Browse: Home / LIFESTYLE NEWS / Photo / Muaythai Youth of the world welcome to the 2017 IFMA Youth World Championships. Muaythai Youth of the world welcome to the 2017 IFMA Youth World Championships. H.E. Mrs Kobkarn Wattanavrangkul ( 3rd from right ), Minister of Tourism and Sports presided over Awards Gala Dinner Muaythai Youth of the world welcome to the 2017 IFMA Youth World Championships at Convention Hall, Ambassador Hotel Bangkok. Picture Show : Minister of Tourism and Sports, H.E. 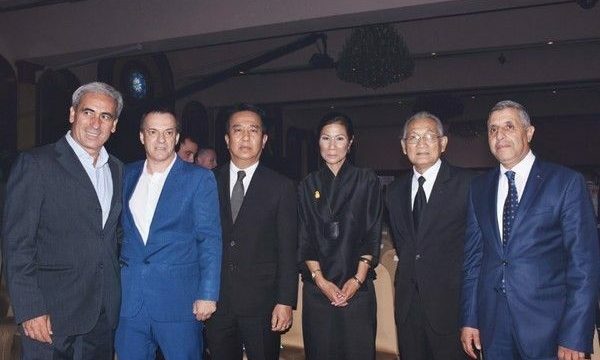 Mrs Kobkarn was being greeted by Mr.Suchart Ketnuam, ( 3rd from left ) Hotel’s General Manager when she arrival at Ambassador Hotel Bangkok along with Dr.Sakchye Tapsuwan, ( 2nd from right ) President, IFMA and President AMTAT under Royal Patonage, Mr.Stephan Fox, ( 2nd from left ) General Secretary IFMA, Dr.Raffaele Chiulli, ( Left ) President of Association of IOC Recognised International Sports Federations and Mr.Abdelkarim El Hilali ( Right ). Over 1,000 athletes and support people registered at IFMA Youth World Championship 2017, with many teams swollen by proud parents travelling to support their kids. Ambassador Hotel Bangkok is the official hotel for this event that held in August 3 – 11, 2017 at National Stadium.